A Classic Lithographed Racing Car Model. Tin Clockwork Racing Car No.8. A Classic Lithographed Racing Car Model. 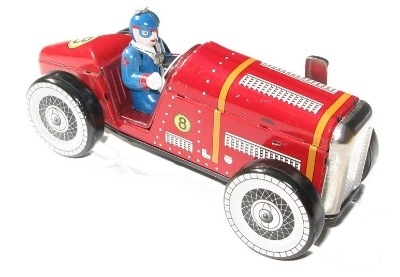 Reproduction of the 1930's original, this superb little clockwork model features a driver in blue overalls. Clockwork mechanism. Original key included. 13cm long complete with original box.